Using mathematics to model the spread of diseases is an incredibly important part of preparing for potential new outbreaks. As well as providing information to health workers about the levels of vaccination needed to protect a population, it also helps govern first response actions when new diseases potentially emerge on a large scale (for example, Bird flu, SARS and Ebola have all merited much study over the past few years). The basic model is based on the SIR model – this is represented by the picture above (from Plus Maths which has an excellent and more detailed introduction to this topic). 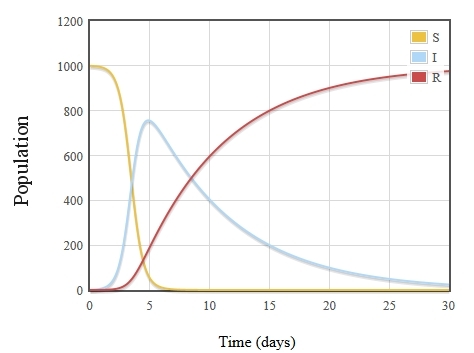 The SIR model looks at how much of the population is susceptible to infection, how many of these go on to become infectious, and how many of these go on to recover (and in what timeframe). Another important parameter is R0, this is defined as how many people an infectious person will pass on their infection to in a totally susceptible population. 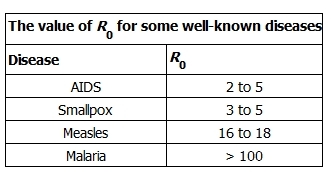 Some of the R0values for different diseases are shown above. This shows how an airbourne infection like measles is very infectious – and how malaria is exceptionally hard to eradicate because infected people act almost like a viral storage bank for mosquitoes. 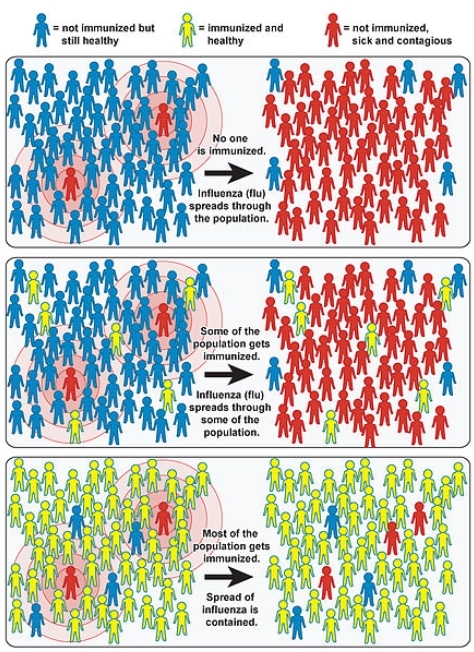 This graphic above shows how herd immunity works. In the first scenario no members of the population are immunised, and that leads to nearly all the population becoming ill – but in the third scenario, enough members of the population are immunised to act as buffers against the spread of the infection to non-immunised people. The equations above represent the simplest SIR (susceptible, infectious, recovered) model – though it is still somewhat complicated! dS/dt represents the rate of change of those who are susceptible to the illness with respect to time. dI/dt represents the rate of change of those who are infected with respect to time. dR/dt represents the rate of change of those who have recovered with respect to time. For example, if dI/dt is high then the number of people becoming infected is rapidly increasing. When dI/dt is zero then there is no change in the numbers of people becoming infected (number of infections remain steady). When dI/dt is negative then the numbers of people becoming infected is decreasing. The constants β and ν are chosen depending on the type of disease being modelled. β represents the contact rate – which is how likely someone will get the disease when in contact with someone who is ill. ν is the recovery rate which is how quickly people recover (and become immune. where D is the duration of infection. 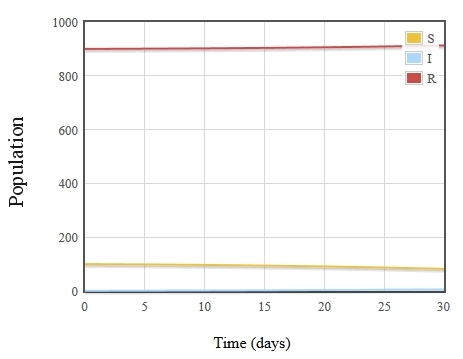 This shows that the infection spreads incredibly rapidly – by day 2, 8 people are infected. By day 10 most people are immune but the illness is still in the population, and by day 30 the entire population is immune and the infection has died out. An illustration of just how rapidly measles can spread is provided by the graphic above. This time we start with a population of 1000 people and only 1 infected individual – but even now, within 5 days over 75% of the population are infected. 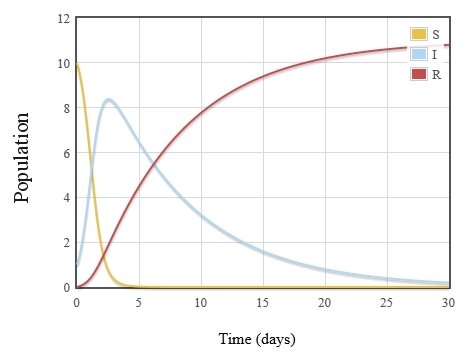 This last graph shows the power of herd immunity. This time there are 100 susceptible people, but 900 people are recovered (immune), and there is again one infectious person. This time the infection never takes off in the community – those who are already immune act as a buffer against infection. Differential Equations in Real Life – some other uses of differential equations in modelling predator-prey relationships between animal populations. How are the deaths caused by measles accounted for by this model? How does one calculate the values of beta and gamma for the SIR model? I know I’m like 3 years late to this but the deaths would have to be calculated by taking the difference of S(0) and S(end time) to give you the total number of people infected, and then you would multiply by the morbidity rate. The model fails to actually account for death, birth or immigration as it models a closed population, so you more or less need to infer the death total from other data you do have.